Joachim Patinir is considered the great early 16th-century forerunner of landscape painting as an independent genre, prior to its definitive development in the 17th century. In his works the figures occupy secondary roles although they are used to narrate the chosen subject of the work. The backgrounds in Patinir’s paintings reveal the influence of Jan van Eyck, Gerard David and Hieronymous Bosch. 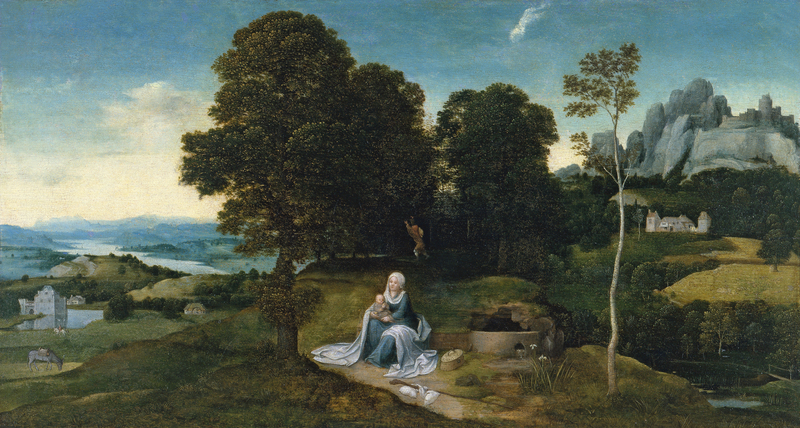 In the present panel the artist used a horizontal format that best suited his intentions regarding the composition, locating the Virgin and Child in the foreground with Saint Joseph among the trees behind them. The rest of the panel is occupied by the landscape, which is constructed through horizontal bands interrupted by vertical elements such as the trees, depicted from a high viewpoint. This same background is to be found in another painting by the artist in the Boijmans-Van Beuningen Museum in Rotterdam and in a work by Joos van Cleve in the Walker Art Gallery in Liverpool. Joachim Patinir is considered to be the forerunner of landscape painting, a genre that began to evolve in the 16th century but which became fully independent in the following century. 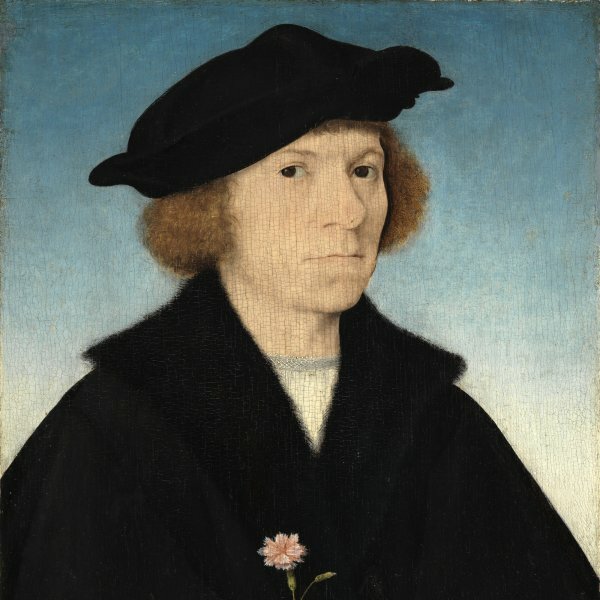 Little is known of his artistic training, and the first dated documentary reference is from 1515 when he is registered in the painters’ guild in Antwerp as an independent master. Similarities between his work and that of Gerard David has led to the suggestion that Patinir trained in Bruges in the circle of David. During his trip to the Low Countries of 1520–21 Dürer met Patinir and visited his workshop in Antwerp where he appears to have had assistants. Dürer described him as “a good painter of landscapes”. The present panel has been in the Thyssen-Bornemisza collection since 1930. In 1902 it was in the Berlin collection of Richard von Kaufmann and that year took part in an exhibition in Bruges on Early Netherlandish painting. The entry in the accompanying catalogue was the first reference to the work in print. It is next referred to in Berlin when it was auctioned at Paul Cassirer and Hugo Helbing in 1917. It remained in Berlin in the collection of Eduard Simon and was auctioned again in 1929 together with other works from that collection. The following year it was shown in the exhibition at the Neue Pinakothek in Munich as it had by that point entered the Thyssen-Bornemisza collection. Patinir’s known oeuvre is small and around twenty works are now attributed to the artist, of which only five are signed. The present panel follows the format that he typically used for his compositions in which the real protagonist is the landscape, while the small scale of the figures makes them secondary elements. Patinir’s paintings depict religious episodes in which he carefully chose the landscape settings in order to set his narratives in large, natural panoramas. We find thus find a preference for scenes of the Baptism of Christ, Saint Jerome, the Temptations of Saint Anthony, Saint Christopher with the Christ Child and the Rest on the Flight into Egypt. The present panel is an example of the latter subject. Patinir used a horizontal format that worked better for his particular aesthetic intentions. He depicted a landscape with the Virgin and Child in the centre next to a fountain, resting from their journey. On the ground we see their travelling equipment including a wicker basket, saddle-bags and a rustic staff, while a leafy glade of trees acts as the backdrop. Among its branches Saint Joseph is in search of food. The gentle hill on which the figures are located is completed on the left by a panoramic view in which the artist depicts a countryside of rolling hills and a river, all seen from a high viewpoint. On the right the landscape reveals traces of man’s presence with a fortress on the top of a small mountain and various buildings lower down among the trees. As can be seen on the left side of the panel, Patinir constructed his landscapes horizontally from bands that are interrupted by vertical elements emerging from the ground such as rocky outcrops or trees. Baldass considered the panel to be an early work. Koch was not in agreement and dated it to around 1515–16, a dating with which Eisler agreed. This dating has now been revised. Passages from this composition have been detected in other paintings, including a panel in the Boijmans-Van Beuningen Museum in Rotterdam and in a work by Joos van Cleve of a Virgin and Child among angels in the Walker Art Gallery, Liverpool. In the latter oil, on either side of the Virgin’s throne Van Cleve repeated the two passages of landscape to be seen on the left and right of the present panel. There are two copies of the present panel in private collections.